Make great-tasting homemade jerky from meat, poultry, and seafood. Includes two packets each of three flavors of spice and cure: Classic, Hot and Spicy, and Teriyaki. Enough seasoning to flavor six pounds of meat. 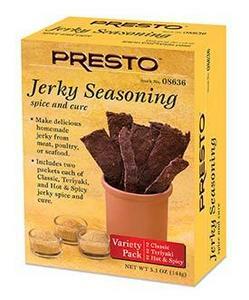 Jerky can be dried using a Presto® Dehydrator or conventional oven.